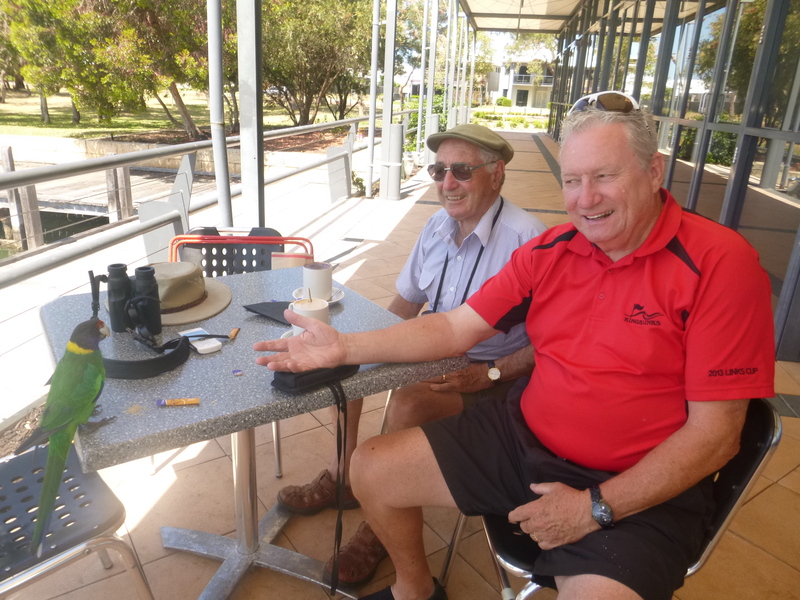 On Wednesday, November 5, twelve birders braved threatening skies to depart Petra’s at 8:15. Bound for Point Roberts were Roger, Terry, Mike, Lorna, Al, Alice, Jim, Rob and Marylile, to meet Ken, Anne A. and Liz already waiting at Lighthouse Marine Park. No border lineup, so the Petra’s crew added a quick trip to the beach at Kiniskis. Roger reported a likely Sharp-shinned Hawk at a side road near our turnoff. On to the beach, where a majestic looking Bald Eagle patiently posed, with many Double-crested Cormorants lined to the west. Largest of the latter revealed itself as a (?) Halloween prank with dramatic outstretched wings. We also saw Pelagic Cormorants and Horned Grebes. Then to Lighthouse Marine Park, a bit windy but still dry. 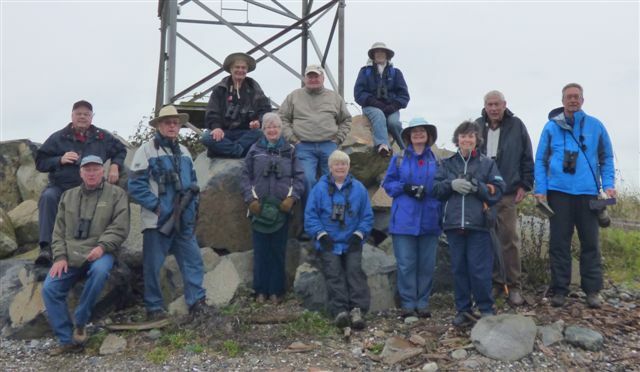 Before the “rock pile” group photo by Roger, we enjoyed plentiful sightings of water birds… Red-necked and Horned Grebes, Common Loons, Red-breasted Mergansers, Harlequins, Surf Scoters, Common Murres (far away), Black Turnstones, Scaup and Buffleheads in flight. Roger left us early for a luncheon date. About 9:45, we drove off to another beach spot down an “alley” between 2 waterfront homes. We passed a GBH guarding a rooftop. and approached a busy group of House Finches. Walking east on the beach, we saw more Harlequins, Black Oystercatchers, Yellowlegs, Killdeer and a Song Sparrow. Back in cars, to travel eastward past the Point Roberts Marina, where we parked just off the road near Oceanside Estate condos. The first bird encountered was thought to be a Flicker, but closer inspection of photos revealed a Western Meadowlark. Soon after a Northern Shrike provided great photo ops. The wind increased as we walked further to see more Black Oystercatchers and Harlequins. Back to the cars for the drive to Maple Beach, immediately south of the border. 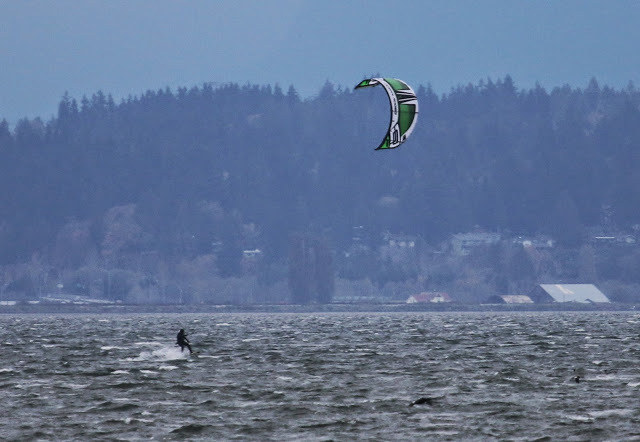 Very windy by now, providing action shots of a colourful kiteboarder with green and white aloft. Rob set off north to walk to the border, noting the flood protection when he returned. The rest of us shivered and viewed many Surf Scoters and distant White-winged Scoters. Thence on for drive to Brewsters for welcome warm soup, etc. Al pronounced birds of the day as Mark the (Meadow)Lark and Shrek the Shrike. Lunch was delicious and graciously served; some snapped up bottles of wine on sale for $4.00. Alas Tom, no brews in that category. Our next outing is Wednesday, Nov. 12, to Stanley Park, including Beaver Lake and possibly Ambleside Park in West Vancouver; maybe lunch afterwards. We leave Petra’s at 8:00 a.m., parking above Second Beach by 9:00 am (see GOOGLE map). At next Delta Nats meeting, on Monday, November 10, Guest Speakers David Bradbeer & Gary Searing will speak about Managing Raptors and Wildlife at YVR airport (details on DNS Meetings page). This entry was posted in *DNCB, Bald Eagle, Black Oystercatcher, Black Turnstone, Common Murre, Harlequin Duck, Northern Shrike, Sharp-shinned Hawk, Western Meadowlark. Bookmark the permalink.